The second conference of the UK Literary Heritage Working Group will be held at the British Library on Monday 30th April 2012. The UK Literary Heritage Working Group, which is chaired by Lord Howarth of Newport, was established in 2005 and campaigns for the implementation of tax incentives to benefit living writers wishing to deposit their papers with UK institutions. It also works to raise awareness of the value of literary archives in terms of their research, educational and creative uses and the cultural benefits to be derived from such collections remaining within the UK. Manuscripts Matter, the Working Group’s first conference was held at the British Library in 2006. The international conference focused on collecting modern literary archives and included discussion of the concerns about the “loss” of British archives abroad, and the perspectives of institutions, dealers and creators of archives. Manuscripts Still Matter will consider the situation for archival institutions, archive creators, and a broad range of users given the changing financial and political climate since 2006. The day will begin with discussion of the situation for literary archives since 2005 and later sessions will consider the archives sector as a whole. The programme includes a session on the use of archives by the Creative Industries, which will include the British Library’s Artist in Residence,Christopher Green, and discussion of funding of the heritage sector with the Chief Executive of the Heritage Lottery Fund, Carole Souter, and others. 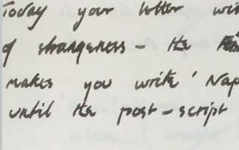 An in conversation session with poets and writers, Wendy Cope, Ruth Fainlight, Ferdinand Mount and former Poet Laureate, Sir Andrew Motion, will consider the feelings of writers and poets on using archives, and seeing their own papers archived. Finally the programme will include a series of short presentations on different literary archive collections designed to demonstrate the vibrancy of theUKarchives and manuscripts sector that the Working Group wishes to champion. Conference fees (including buffet lunch and refreshments): £20. Please direct any enquiries to Helen Melody (helen.melody@bl.uk). To make bookings, please go to the British Library website at – http://www.bl.uk/whatson/events/event129607.html. Next Post Cataloguing Guidance Now Available!